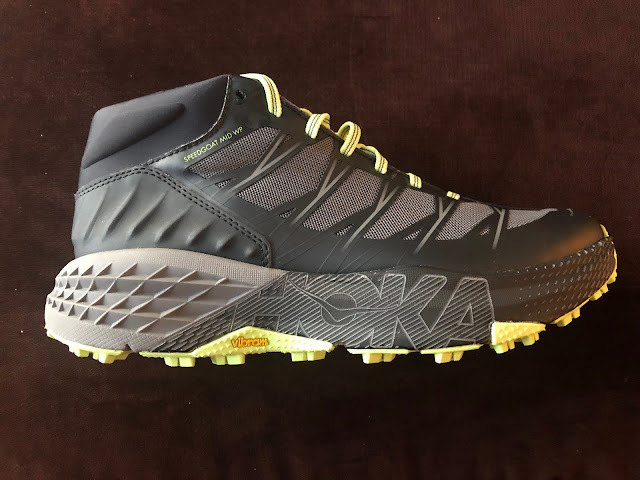 The Hoka One One Speedgoat Mid WP adds a waterproof breathable SkyShell soft bootie upper and a mid height substantial ankle supporting but not constraining cuff to the iconic super cushioned Speedgoat trail runner, without adding a big weight penalty. It is shod with a versatile Vibram MegaGrip outsole which is equally effective on snow, hard ground, or rock. The result..both a highly capable trail runner for rough and wet terrain and a superb light hiker, fast packing and thru hiking option with considerably more comfortable and softer cushion than the usual hard cushion of traditional hikers. sturdy cuff and padding around the ankle, which is somewhat deceptive, as it gives the appearance of a heavy hiking boot, but don’t be fooled. Midsole/outsole looks identical to the Speedgoat 2 and 3. The lines of the upper look smooth and supportive, with an array of welded overlays for security, though arranged differently than the Speedgoat 3. Sam: As Jeff says, it looks big and heavy but isn't on the scale or on the foot. The fit is true to size with decent additional room for somewhat heavier socks. The top box while not super wide has plenty of overhead room for me. Jeff: The upper is what sets the Speedgoat Mid WP apart, featuring a Skyshell membrane to keep out moisture and drafts. Welded overlays secure the midfoot, connecting to each of the 7 lace eyelets, plus one additional set of overlays across the forefoot of the shoe below the lowest eyelets for good measure. The over the ankle mid height collar is very well padded and somewhat stiff at first, but it quickly broke in and I easily became accustomed to it. Once I got used to the high collar, it generally went unnoticed and I came to appreciate the added stability on technical downhills as well as the protection. Additionally, the high collar has supplemental padding on the outside to guard against rock hits or banging my shoe into my ankle bone, which is much more likely when running in the snow and can be especially painful if wearing Microspikes. The high ankle collar however does not take the place of a gaiter, as some Winter shoes have built in. The thick padding does not hug tight against the ankle and in deep snow, snow works its way into the collar, so remember to add a gaiter if trudging in deep snow! Fit is true to size and consistent with the Speedgoat 3 and even though I normally size up a half size to accommodate for a thicker Winter sock, I did not feel the need to size up in this instance. Security and foothold is especially good, somewhat bolstered by the high collar and generous overlays. The Skyshell upper does a great job keeping the moisture out in all of the snowy conditions that I have encountered, from deep dry snow to wet slushy slop. In temperatures down into the teens, my feet have been comfortable with a mid weight wool sock and suspect would be OK for me into the single digits if continually moving. In temperatures into the 50’s and even close to 60, my feet have also been comfortable and did not overheat. At first I found that I had to really crank the laces to achieve a proper fit and found the laces to be a bit too thin, but over time as the shoe has broken in, I no longer notice any added effort to tighten/adjust and the laces feel suitable. I have found that getting my feet into the Speedgoat Mid WP takes a bit of effort (not a shoe to slip on for a quick trip to the mailbox), but once in and laced up, well worth the effort. Fit is identical to the Speedgoat 3 and though I don't necessarily have stability issues with the Speedgoat 3, those who may have trouble with the high stack may find the higher ankle collar somewhat assuring in technical terrain. Sam: I concur with Jeff's assessment of the upper and its performance. All of my testing (running and snowshoe running as well as around town) was in cold conditions from the mid teens Fahrenheit to just above freezing on wet and dry snow. My feet were dry and warm, but never to warm at all times. The implementation of the SkyShell waterproof bootie into the upper is superb. SkyShell essentially feels like the normal soft lining in a shoe or boot. There is not "crinkly" stiff sense or disconnect between membrane and rest of upper as often seen with such uppers. The thin overlays and very pliable toe bumper are effective in securing the foot without constraining it. While not a super wide toe box there was plenty of well held room and overhead volume up front. The mid cuff clearly had lots of design attention. I was surprised that while it gave the rear of foot great support it was not boot snug around the ankle allowing my foot to flex forward easily on the run. The exterior dense padding was appreciated to protect my ankles from kicks. Yes, gaiters are in order in deep snow but by and large in more moderate depths or firmly packed snow are not needed. My only qualm with the upper design and construction are the thin laces combined with a thinly padded tongue. I found when wet and otherwise they tended to stretch and not provide quite as much lockdown as I like, This said with the high cuff stability was not as compromised when the laces were looser than in a conventional height shoe and certainly not as in a regular Speedgoat given the super high stacks here. Jeff: Identical to the Speedgoat 3. The midsole looks large (and is large), but as is the case with the majority of Hokas, the foot sits much deeper within the shoe than the sidewall height suggests, enhancing stability due to the Active Foot Frame technology. For such a large running shoe, the Speedgoat Mid WP feels reasonably light and agile, especially for a fully featured and protected Winter running shoe. 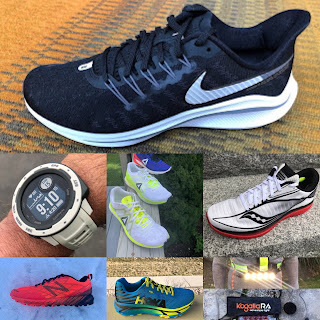 Cushioning is plush as you would expect from a maximal Hoka and I find the Speedgoat, Mid WP included, to be relatively quick and responsive for such a maximal cushioned shoe. The Speedgoat midsole is ideal for hard surfaces and all day jaunts no matter what is underfoot. Sam: The super cushioned and relatively soft (for a trail runner) Speedgoat midsole in the low height Speedgoat is not my favorite for any kind of faster trail running. I find it mushy and kind of unstable with not much ground feel. Taken slow or hiking it is great. Here, thanks to the cuff things changed for me. While all my runs were on snow it was often very hard packed and uneven and I had zero stability issues. 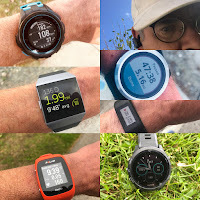 As with most Hoka, I find that the stiff rocker approach requires knee lift on uphills vs a digging in of the toes with some flex to shoe, such as experienced in shoes such as the Uragano GTX, Speedcross 5, or Altra Lone Peak 4 RSM. (See my winter trail run shoe roundup below) and even Hoka's own EVO Mafate. 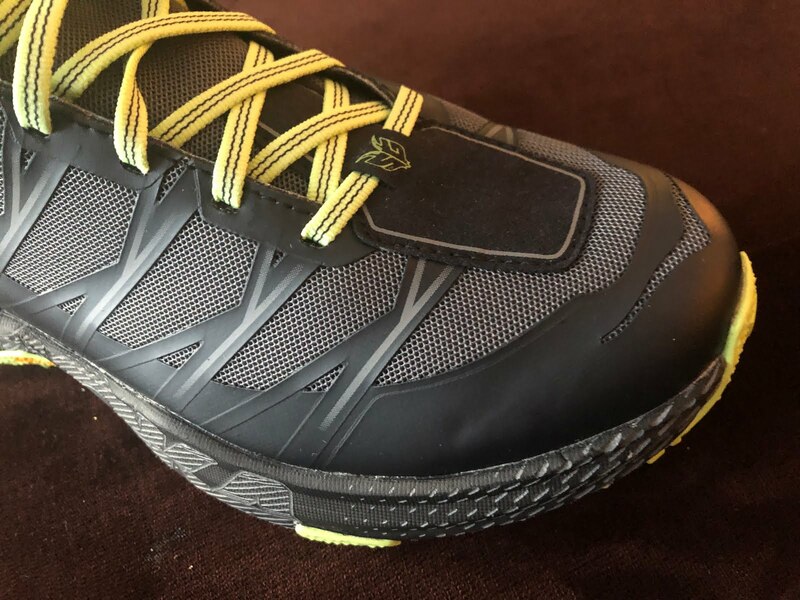 Jeff: Having put hundreds of miles on several pairs of Speedgoat 2 and 3, I can attest to the top notch performance and longevity of the Vibram Speedgoat outsole. The lugs are deep, numerous, well spaced and uniquely shaped to provide very good traction on a wide variety of surfaces, wet or dry, snowy, icy, on trail and off. The slow wear rate on the Vibram Speedgoat outsole is very impressive, even on the rocky, technical trails that I frequent. My most beat up pair of Speedgoats have over 200 miles and I don’t think I have even worn down ⅓ of the tread, most of the wear showing at the toe/forefoot from steep and rocky climbs. 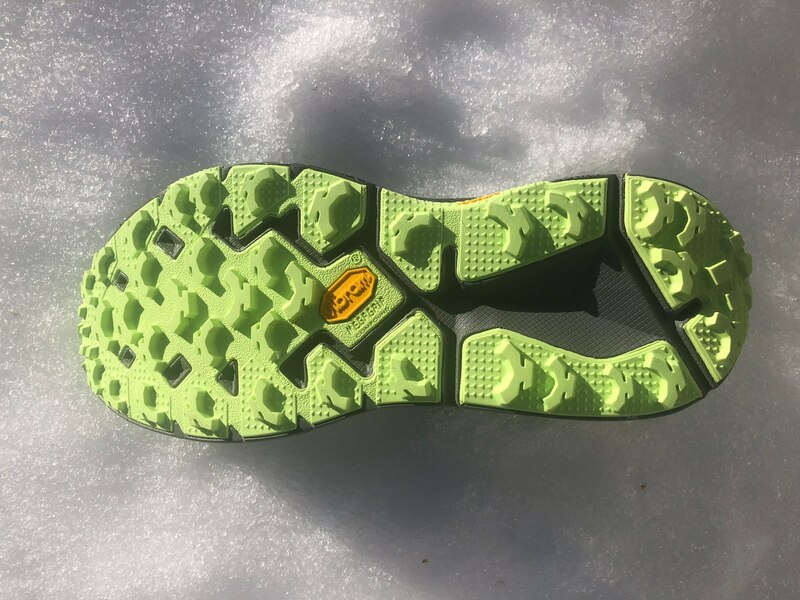 Being a dedicated snow/wet weather shoe, I would love to see deeper, more pronounced lugs, but that is a very minor complaint given the overall versatility of this outsole and that I am often quite likely to be wearing Microspikes with this shoe anyways if I feel like I need more traction. Sam: The MegaGrip outsole is outstanding in its versatility and performance. In my comparative on snow test the Speedgoat Mid was second only to the very aggressive Speedcross 5 in uphill and downhill grip on very hard packed snow. 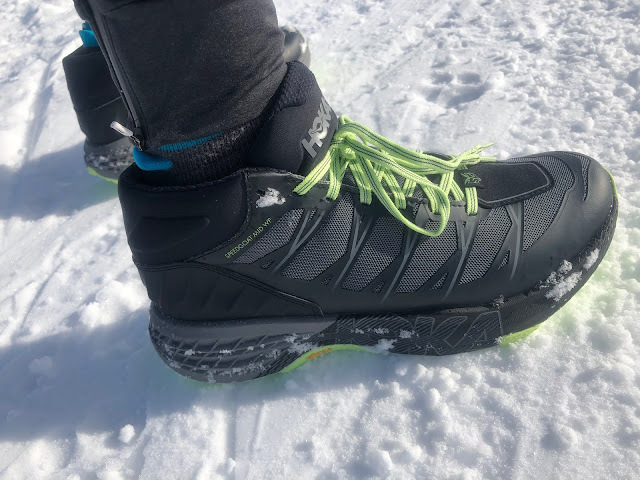 Jeff: Fortunately, there are no big surprises here with the Speedgoat Mid WP, it is everything you love and would expect from the Speedgoat 2 and 3 with a waterproof upper and padded, over the ankle cuff. I really appreciate the well rounded protection offered up by the Speedgoat Mid WP, from the wet and cold with the Skyshell upper, over the ankle protection for the unpredictability of running fast through snow with unstable footsteps (especially with Microspikes on your feet) and protection from the maximal cushion underneath, not just cushioning from hard and rocky/rooty surfaces, but also the added padding helps to insulate from the cold. The Speedgoat Mid WP is a very versatile winter all rounder that is just as much at home on snowy, slushy wet streets as it is on steep, technical mountain trails, with or without snow. 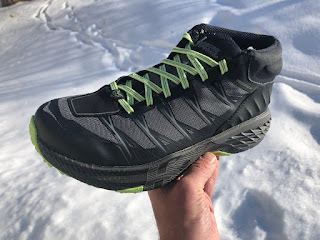 If you are looking for a warm, waterproof, protective, versatile, maximal winter trail running (any running) shoe, this is one of my top picks/first recommendations and has earned a spot at the very top of my Winter rotation of shoes. 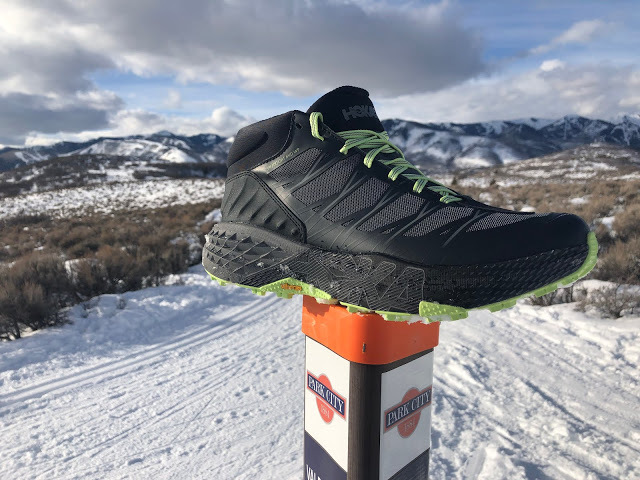 Sam: The Speedgoat Mid WP is one heck of a rough terrain and conditions option for trail (and road) running, snowshoeing, fast hiking, and messy wet and winter every-day use. I enjoyed running it hard in all kinds of snow from powder to very firm. The upper is superb in its very smooth fitting waterproof breathable support backed up by the effective cuff, which for me will make the Speedgoat a better shoe for rough terrain faster running than the low-cut versions. When the relatively light weight of 12.6 oz for a mid-height water proof shoe and its additional cuff support is combined with the soft cushion and all terrain MegaGrip outsole the Speedgoat Mid for sure is also great fast hiking option. I think it will become a leading thru hiking choice on the Appalachian, Pacific Coast Trails as well as for Alps trekking. With a May trek across Switzerland in the planning it will be one of the options I will consider. -0.1 for thin laces which also stretch some when wet. Easily replaced but a thicker lace would have perfected the Speedgoat. Interestingly support didn't suffer too much when laces loosened and stretched but could be improved. After a while I just plowed ahead without retying. -0.15 a Speedgoat is a Speedgoat, stiff and massively cushioned relying on the rocker and knee lift to drive forward, but I do wish for more flexibility as Hoka was able to achieve in the EVO Mafate. 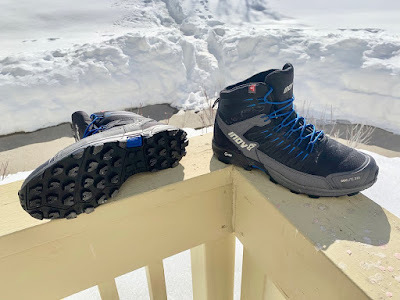 Jeff: The Uragano is more flexible, compact/agile, has a built in gaiter, more pronounced lugs and is a bit lighter, (though on the feet, they feel about equal weight). I find the Uragano to be a bit more high performance, but would pick the Speedgoat Mid WP on colder days for the added insulation and the protection they offer is often a huge bonus. Sam: The built in Uragano gaiter is a plus and I agree with Jeff it is more flexible way up front for climbing but also less protective there as there is not the stack of the Speedgoat in the forefoot or rock protection there. This said I found the Speedgoat more breathable and comfortable as the temperatures rose, its outsole more versatile, and its looks more suitable for off trail wear and as such a better all seasons wet and rough conditions option. Hoka One One Speedgoat Mid WP vs. La Sportiva Crossover GTX 2.0 (RTR review): Jeff: The Crossover 2.0 GTX is bombproof, perhaps a bit better protection/durability /traction /waterproofing for all mountain adventures that involve a lot of rock and scrambling, but for day to day more typical trail running, the Speedgoat Mid WP is lighter, quicker, more comfortable and more forgiving. 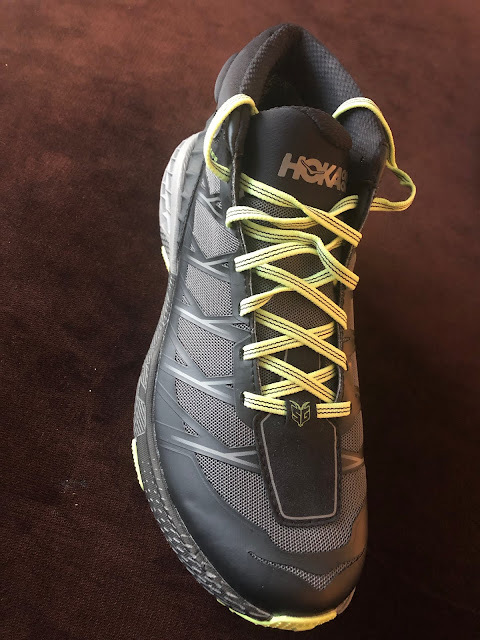 Hoka One One Speedgoat Mid WP vs. Hoka One One Tor Ultra High WP (RTR review): Jeff: The Tor is much larger and boot like than the Speedgoat Mid WP, but is more sturdy and protective for more serious conditions. Though neither is insulated, the Tor has thicker upper materials and is a warmer shoe and with lots of leather, a higher ankle and beefy toe bumper, the Tor shines in cold, snow and rough terrain, but at slower speeds. The Speedgoat Mid WP is much more geared toward actually running than hiking, much lighter, more nimble and agile. Jeff: The Speedspike CS has carbide studs, which are a huge advantage on icy terrain and even without the spikes, the deep and aggressive lugs of the Speedspike CS are hard to beat, providing unsurpassed traction. Fit is predictably secure and the Speedspike CS is quick and agile on the terrain for which it is intended and is also very water resistant. The Speedgoat, while not being able to compete on out of the box traction, is overall more comfortably cushioned and protected with the over the ankle collar. Sam: The 335 is a mid height "boot" with a very agile trail shoe chassis. It checks in a touch lighter than the Speedgoat Mid. It has a water resistant upper and a touch of Primaloft insulation. Designed for very cold climate running and hiking it has proved suitably but not overly warm but also not particularly water resistant so far when things get sloppy. At my true to size, and true to its cold weather purpose, I need to wear heavy socks to keep it from being to roomy. The key difference here is ride. While you cruise along in super cushioned comfort in the Speedgoat the Inov-8 chassis can really dance over uneven terrain. Its upper is not quite as supportive with thin rope laces but is very smoothly comfortable and roomy in the toe box in particular. 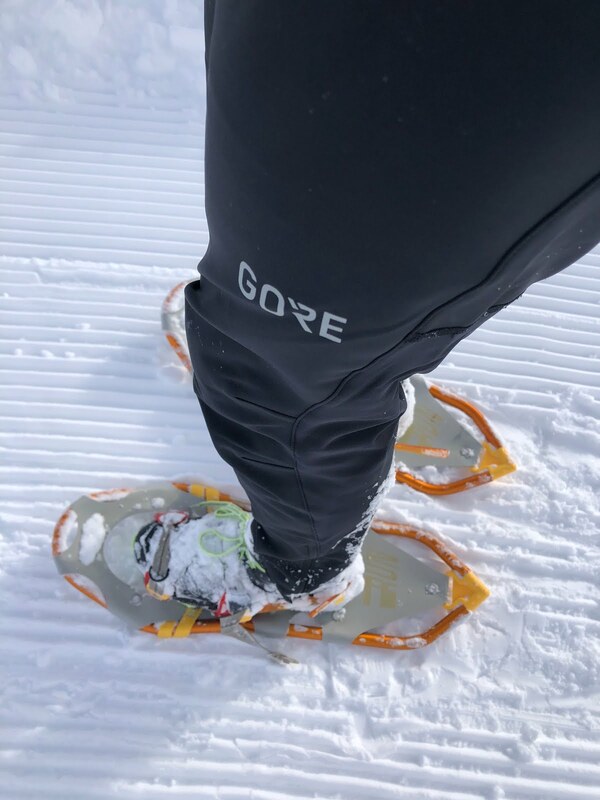 Featuring a new very high durability outsole with Graphene in the mix, and greater contact area flatter lugs than the Speedgoat, it does not quite have the on snow grip of the Speedgoat. 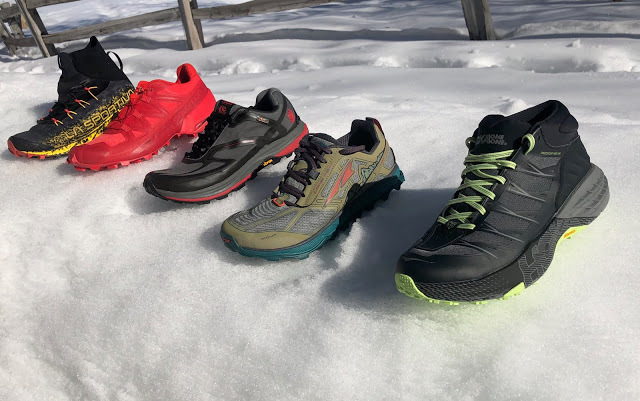 Please read our 2019 Winter Trail Shoes Round Up here . We closely compare the Speedgoat Mid WP, Salomon Speedcross 5, Altra Lone Peak 4 RSM, Uragano GTX, and Topo Hydroventure 2. Similar width to Torrent but somewhat more substantial upper material. Also a bit higher toe box given not as stretch with the membrane in the Mid. I am both true to size. Also for hiking trekking look at the new Hoka Sky Kaha, basically Speedgoat type midsole, high very light very roomy upper. I need heavy socks at true to size in them. Also a bit lighter the new Sky Toa. We will be reviewing both in May when my wife and I trek across Switzerland in them.